Boston has a long and storied maritime history but it’s 1992’s Sail Boston that is especially significant to me. That was the year my father, now a retired Cambridge Police Officer who spent 40 years on the force, was assigned to the Tall Ships fleet. This came with a few perks: a shiny new minivan (exciting stuff for a station-wagon family) and a mobile phone. For the uninitiated, I’m not talking about a sleek machine with a sharp screen; many of you will remember those early cellular phones, stored in a large leather bag with a shoulder strap for easy carrying. It was one of the coolest things I had ever seen as a teenager. At the time, I had no inkling of the subsequent proliferation of smart phones and their formidable computing power…and how we would come to depend heavily on them. I also didn’t know then that I was witnessing the start of a megatrend, forces that affect our lives in powerful and varying ways. Megatrends change how we behave and how we interact. They create new industries while marginalizing others. They become a meaningful part of investment markets, though it can be easy to overlook their impact in their early days. At NEPC, we recognize that there are forces at work that will likely affect markets (and our lives) in the decades to come though their impact may be imperceptible over a five-to-seven-year investment horizon. Today’s megatrends may not result in immediately actionable investments, but understanding them and their long-term influence will allow investors to potentially identify nascent opportunities across asset classes and geographies. Artificial intelligence: A growing number of organizations are focusing on the analysis of large, unstructured data sets and environments to drive insights (targeted advertising), efficiency (image or language recognition faster than humans), and computing action (robotics and automation). Demographics: Longer life expectancies and declining birth rates have led to an aging of the global population. This has created opportunities in a variety of industries, while also fueling longer-term structural challenges around promised retirement benefits and the ability to deliver them. 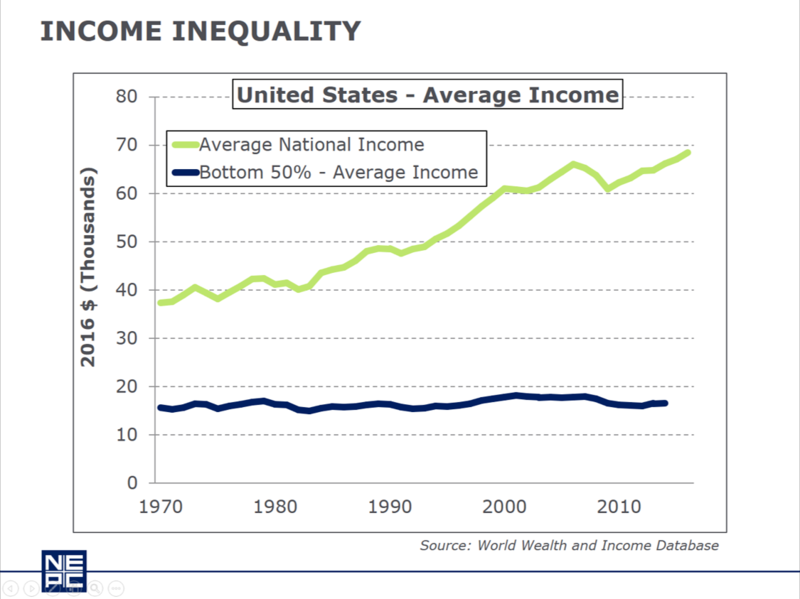 Income inequality: The rising tide of economic prosperity has set some boats adrift as real wages remain stagnant. Wealth has become increasingly concentrated, creating social, economic and, most notably, political disruption. Shifting currency regimes: Over the last century, we have witnessed the gold standard and (since 1971) a fiat-based currency regime characterized by the US dollar as the reserve currency of the world. That could change if the world shifts to a more diversified basket of currencies. Most recently, cryptocurrencies are the new rage. While cryptocurrencies may have their benefits, they remain volatile and markets trading these currencies are still developing and remain untested. In fact, the true megatrend may be blockchain, the technological foundation for cryptocurrencies. At NEPC, we believe these megatrends have the potential to disrupt and impact our lives, possibly in ways we do not expect. To this end, we are focused on closely following the evolution and metamorphosis of these megatrends and their social and economic impacts. Stay tuned as we learn more.